I’m planning a month of riding over late July-early August and the Arizona trail has piqued my interest. I read about your trip there in Jan, looks fantastic, but am a bit concerned about going in the heat of the summer. Do you know anything about this? Any problems with heat? There is a warning on the AZT website, about travelling in the middle of summer, but I also see quite a few events going on in July-August on the trail as well. The northern part of the Great Divide is my plan B but all that singletrack on the AZT sure looks tantalizing :). Also open to any other recommendations you might have. Any insight you might have would be greatly appreciated. Thanks! Ted, Ontario. 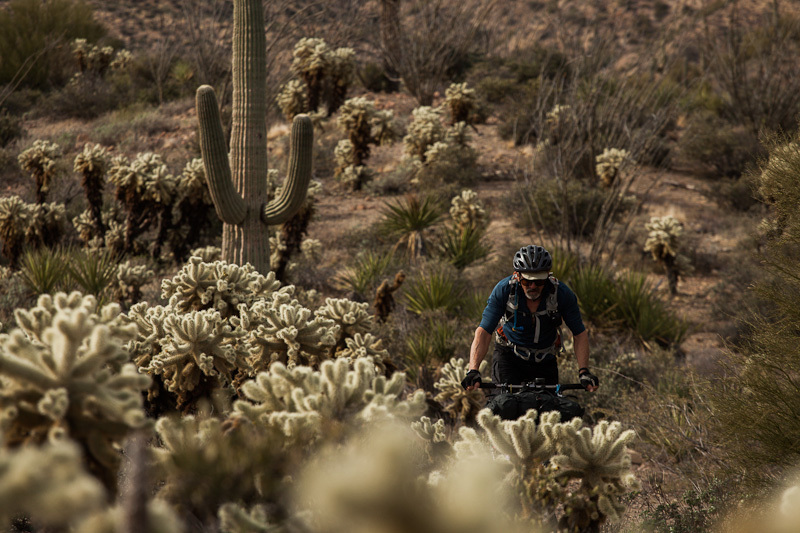 Ted, to be honest, I’m not sure that the Arizona Trail is ideal mid summer, at least not across the southern, low lying terrain – which is the majority of it. Hauling water would certainly be a real issue, as would ensuring planned water points aren’t dry. I’m sure it’s possible, but spring and fall would seem a whole lot more pleasant. I’m a big fan of the Great Divide. Although it’s lacking in singletrack, the scenery is stunning – and the northern portion is certainly a highlight. I’d work in some extra days in your schedule; that way you can get in your singletrack fix. My tactic? I stopped by any bike shops I passed to get the lowdown on the best local trails. Or, ride the segment from Steamboat Springs (there’s an airpot shuttle from Denver) to Cuba, New Mexico. Cuba has a bike-friendly bus to ABQ (great local trails in Otero Canyon), which in turn has good bus connections back to Denver, with the El Paso-LA Limousine Express – despite the fancy name, it’s a cheap Mexican bus. This Coloradan/New Mexican segment of the route has excellent singletrack stopovers – eg Steamboat, Brekenridge and Salida. Riding the Monarch Crest and Rainbow Trail, out of Salida, is a favourite of mine. While you’re at it, you could also hop on the Railrunner and visit Santa Fe, and explore some of the trails there – the Windsor and Rio en Medio being local classics. The AZT. A great ride, but extra tough in the height of summer. This entry was posted in Q&A on July 6, 2013 by Cass Gilbert. I like ASK. I know you are constantly answering e-mails in great detail. Sharing is useful to others. Pot of sunshine in France. Now… on the to AZT!